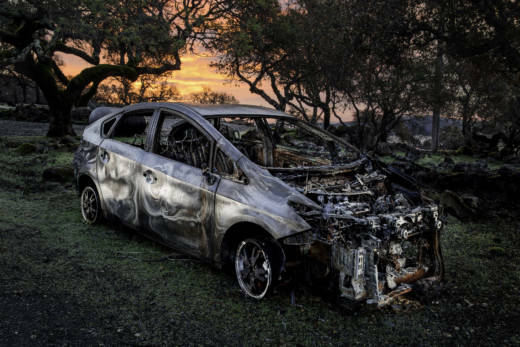 "The whole scene was so surreal," says commercial photographer Scott Maddern, of his trips to photograph the areas torched by the North Bay fires of 2017. "Wherever you go to these places, you see a chimney and you see a car. Everything else is leveled." More than 30 of the photographs he took will go on exhibit at the Peninsula Museum of Art in Burlingame August 8. 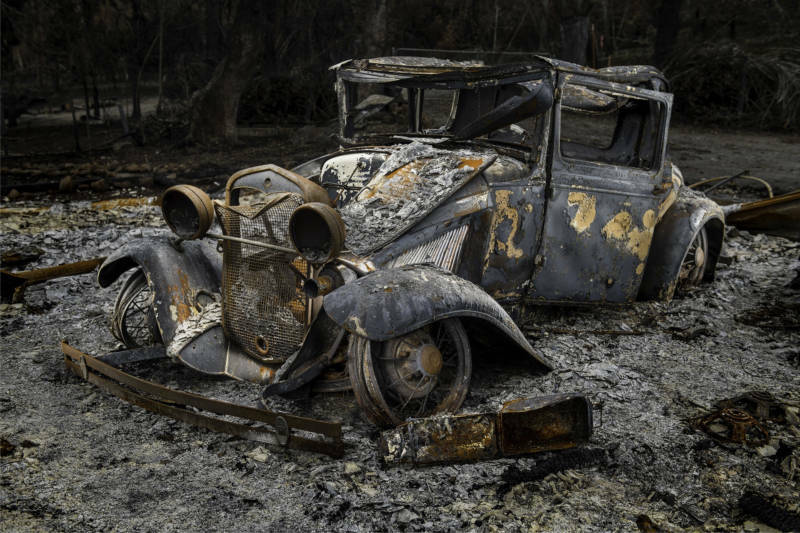 Art out of Ashes, with its grimly beautiful images, seeks to highlight the damage wildfires can do in California, and to remind us survivors are still struggling to recover. The exhibition is also a direct nod to the great Bay Area photographer Richard Misrach, who famously shot haunting portraits of what was left after the Oakland Firestorm of 1991. Driving through the recently cleared streets of Oakland and Berkeley, Misrach shot image of melted and charred fragments that implied poignant narratives beyond the frame. The large, detailed prints inspired contemplation, urging us not to forget the history. "Photographs change their meaning over time," Misrach said in a gallery talk about the series seven years ago. That’s what inspired Bay Area businessman Russell Hyzen to come up with a similar concept for the North Bay. He contacted Maddern, and even provided lighting support as the two wandered through destroyed neighborhoods, looking for cars. "You know, I'm a car guy," says Hyzen. "I went up there and looked at the landscape and noticed these cars, and that's when it hit me." 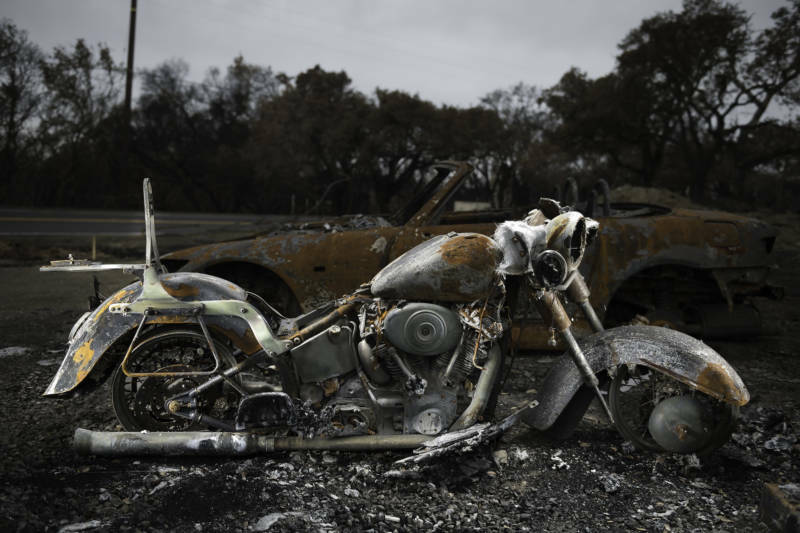 Images this striking, he thought, could help raise money for fire survivors in the North Bay. "A lot of these disasters, you know, when they're over, people forget and they’re on to the next thing," Hyzen says, adding wildfires are becoming such a common occurrence in California, it’s easy to lose track of the ones that passed. "The rebuilding and the need lasts so long, but the media attention goes away very quickly, because of the world we live in," he says. Hyzen lives in the Oakland Hills now. "You know, I've heard all these stories over the years about what [neighbors] went through in the fires." He used to live in Glen Ellen. "Many of my neighbors’ homes right around there burnt down, and then one of my very, very close friends lost his house. All these personal threads in my life kinda motivated me to, you know, help and give back," Hyzen says. Profits from sales of the prints, a companion coffee table book and fundraisers are promised to the Sonoma County Resilience Fund. Hyzen says it appealed quite simply because it's the only fund dedicated to the community’s mid- to long-term recovery needs. "Everything over the hard costs like printing the photos," Hyzen vows, will go to the fund. Caitlin Childs, Director of Communications at Community Foundation Sonoma County, which runs the Resilience Fund, says she's been in conversation with Hyzen. So far, she says, the fund has raised more than $14 million from a wide and heartening variety of initiatives launched to help fire survivors. We have not forgotten. Art out of Ashes runs August 8-12, 2018 at the Peninsula Museum of Art in Burlingame. More information here.